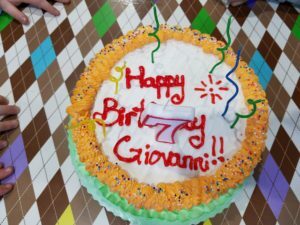 G and I began talking about their party ideas for their 7th birthday party, which was sneaking up quicker than I had planned. They both had different ideas and wanted to do different things. Then out of nowhere they both decided they wanted to do separate parties. Wait, what? I couldn’t believe what I was hearing. My two soon to be 7 year old twins no longer wanted a birthday party together. This blew my mind. I wasn’t ready for it. What just happened? I knew this day would come but I expected I had a few more years. I was hoping this thought wouldn’t come up until they hit 11 or 12 but I was wrong. It was happening now. Right in front of me. They were deciding and planning what was going to happen. Not only that but they turned to me and asked if they could invite their own guests. My chin just hit the table and my mouth remained open. Did this mean not all their classmates would be invited? Did this mean no childhood friends? Wait, what did this mean? Giovanni kindly told me that he wanted to only invite his everyday friends meaning friends he saw every day. He wanted to pick and I would write his list down. Isannah then said the same thing. Here I was grabbing a pen and paper and writing down each name as they shouted them to me. I kept looking at the list and thinking about people I would like to invite but just kept my mouth shut. I was letting them take the wheel. I wanted them to feel like this was their time. After the names were shouted and after I stopped writing they each looked at their list. They were smiling and so proud of themselves for doing it all on their own. I couldn’t crush their joy. Not their moment so I sucked it up and let it go. Fast forward to Giovanni’s party. It’s here. It’s TODAY and the excitement was real. He woke up asking me how many more hours for his party. He must’ve asked me 20 times if it was time to leave. This was what he picked and he was so excited to share his chocolate making experience with his everyday friends. I planned all the details and when we walked in his face lit up. He was excited to show his sister the place and explained to her all the fun things they would be doing. As his guests were arriving he greeted them with smiles. It was like he was turning older than 7. I was frantic as always to make sure everything was going smoothly and all who were coming were happy but I calmed when I looked at him. He was just enjoying his day. What I loved more was that his sister was letting him be the person for this time. She allowed him to have the attention and was supportive. Everything was going well. The kids were screaming with excitement. Singing at the top of their lungs and dancing like no one was watching. It was great. I looked around the room and was happy for him and for everything that was going on. It wasn’t until it was cake time that I felt my chest cave in and tears began falling on the inside rather than outside. I was crying inside because when the party host placed his cake in front of him I knew it was just his celebration. It wasn’t a cake with both names on it. It wasn’t a cake placed in front of G and I to celebrate both of them. It was only placed in front of Giovanni. He sat there and looked at his cake and listened to everyone sing happy birthday and when the song was over he proudly blew out his candles and I quietly cried. It was harder than I thought to see that happen. I was happy for him and proud but I couldn’t help feeling a little sad that it wasn’t both of them together. I pushed that feeling away because I couldn’t let it take over me. This was a happy day. 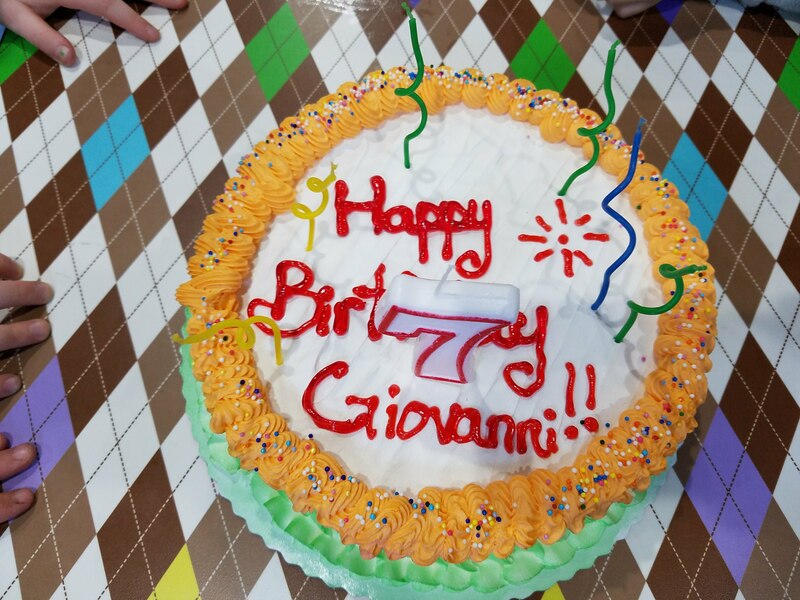 This was Giovanni’s day and this was just happiness. I remembered that Isannah would get her solo birthday party and celebrate it the way she wants. That day will be a day of friends, happiness and joy. Let’s just say I can’t promise not feeling a little something when a cake is placed in front of her that day. I guess its just part of a being a mama of twins. You wake up and take your first thank you breath and at that moment, you have to decide if it’s going to be a good day. No matter what you are going through or the craziness you know you are surrounded by, you need to make that decision. Try really hard to just think of all the good in your life. Think about the beautiful memories you’ve created. Think about the person that makes you smile and just remind yourself you made it to another day. After you thought about all that, get on your feet and begin this day as a gift. Make it count. You may be the face that person needs to bring a smile to their face. The hope they needed to see today. Make it count. The kindness that you have inside you spread it around. Let it infect others so that it keeps going. Today is a gift. Make sure to share it with others. My husband reads pages from Harry Potter right before bedtime to G and I. If we are running late with our bedtime routine we skip the night but tonight everything was right on schedule. The kids both snuggled in their beds while he began reading where they left off. I love the silence and just the sound of my husband’s voice very animated and alive. He changes his voice and tone with every character he reads. I just sit back in my room and listen with a smile. After they were done reading, it was time to go in each room and say goodnight. When I walked into Isannah’s room she immediately told me she wishes she was a girl witch like in Harry Potter. I asked her why and she responded by saying, “If I were a girl witch then I would be able to have powers and go back in time to where Nonna’s mom was alive so I could meet her. I think it would be a nice idea to meet Nonna’s mom. I never met her but I think about her a lot. I think that would make Nonna happy.” I just smiled and agreed with her. I said it would make a lot of people happy and she would be so happy to meet you too. I gave Isannah a hug with tear filled eyes. That was so sweet and tender and I truly was happy to hear that from her. If reading Harry Potter brings out this kindness even more, I hope the books last forever. Today brings many changes. From the calm wind blowing more cool air than days previous to the mentions of First Grade for our new adventure. There are many things in between that are in my heart. A lot of acceptance and faith that what lies ahead was always meant to be. It’s a day of decisions being made and the hope that keeps us afloat. We are given each day as a gift. A day better than the last no matter the difficulties we feel or the mountains we must climb. It is still a gift we didn’t need to receive and now have to enjoy the love of family and friends. The life that is bursting around us to enjoy and take in. It’s with an open heart and mind to help us see things more clearer. Sometimes it’s easier to let fear take control but you are stronger to see above that and move forward. That is when you can see the world and the life you have before you with a clear view. Today may be your day. Enjoy it. Appreciate it. Love it. Make it what you want it to be. We have been truly blessed every year with some amazing teachers. From the very beginning when the kids began their educational journey and I was frantic to let them go and worried about how their teachers would treat them, I saw the love and kindness in the eyes of every teacher I met. They reassured me every day that G and I are fine. It’s a beautiful bond to experience and a comforting hand that is very much needed. This year is no different. Not only are they present, available, kind and supportive they are also friends. My family and I have gone through some tough times throughout the years especially this past week and even though my mind was filled with fear and just all over the place those teachers have been present and went out of their way to make me understand that their thoughts were with us all. From the inspiring texts, to the hugs along the way, it’s been a blessing to us all. When people ask me about our current school I simply smile without hesitation just thinking of the wonderful teachers we have had and the staff that has become apart of our life. It’s friendships like these that see no boundaries, no color and no religion. It sees love, kindness and care. We are truly blessed with our kid’s teachers and in return, I would like to say thank you once again. To all the teachers out there that take care of our children, we thank you. To those who put the needs of their students before their’s, thank you. During this time of year and every day, take time to thank a teacher. This is a bit different for me but thought it was time to show my thankfulness to someone who truly deserves it. As women (and I’m sure a few men out there) the search for a salon that makes them feel comfortable and makes it easy for them to walk in and know they will be treated kindly, takes a lot of energy and effort. Salons these days are a bit too up tight for my taste and crazy pricy. In my search for salons I read reviews, a ton of them. Did the walk by test and tried everything to find the one that will work best for me. After reading amazing reviews you schedule an appointment. You walk in and meet the amazingly skilled person that’s worked with actors and actresses to find they are really not as great as everyone said. The service is average but the actual product not so good. You convince yourself it’s the stylist first time and she might not know your hair so you give her another try. The second time turns out even worse. Not only does she mess up your hair she gives you a million of non-related excuses. I know I don’t have a stylist license but I’ve been doing my hair forever and it is my hair so it’s been with me all my life. It’s funny how they try to give you excuses and think you will believe them. Then you have the salons where just walking by them on the street makes you want to walk faster without looking in or the salons that are bothered by your questions. See they are all here to provide a service but it’s up to you to trust your hair, although not the most important thing in your life or world, but it’s yours. This brings me to a new salon with an old school feel. It’s a mobile salon to be exact. That’s right, you read that correctly. It is a salon on wheels. I see people pass by it when I’m in the area. They stare and talk amongst themselves trying to understand what it is. Then I see those that pop in and ask questions with excitement. This is when Caroline, the owner of Studio in Motion just answers any and every question in a way that makes you feel comfortable. She’s not stuffy or snooty. She doesn’t give you attitude no matter how busy she is at that very moment. She answers all your questions. It’s amazing how friendly she is. I walked in there one time a few years ago to get a blowout and she immediately identified all the unhappiness in my hair that I was trying to cover. She gave me a solution and actually corrected it. She told me everything that I knew was wrong with my hair. At that point, I had just given up on it because I was so tired of dealing with it. She made me feel comfortable instantly and I’ve been going to her ever since. Her prices are fair and she will pack that mobile bus to make sure she gets everyone in the time she promised. No matter how jammed she gets she makes everyone feel comfortable. Keeps them smiling and gets them in and out in the most pleasant way. Her clientele is diverse. There is no type or style, everyone is welcomed and everyone leaves smiling. While I’m on her bus I see the oldest old school neighborhood clients to the youngest of clients popping in. She does them all and she’s fair. To find a salon that brings back the genuine neighborhood feel mixed with the new feel keeps you smiling. Caroline really makes you feel like you are a part of her family during that time you are in her chair until the time you walk out. When I walk in the neighborhood and see her parked in her spot at the corner of Court Street and 1st Place in Brooklyn, I smile knowing she is there. Sometimes I just pop in to say hi because I can. I was feeling a little overwhelmed and this is when I’m the hardest on myself. It’s when I begin remembering all the times I lost patience and got more upset than I wanted to. Remembering how easily I got upset this morning while I was trying to get the kids fed, cleaned, and ready to head out the door. I was making breakfast and then lunch and the time was passing and the kids were moving so SLOWLY and I knew I still had so much more to do. At that point, I should’ve pulled away from the situation and just taken a moment to let whatever was boiling inside me disappear but I didn’t. I raised my voice and began to rush the kids and myself. I didn’t like that feeling but didn’t realize it until I dropped them off. Once we got out of the house everything seemed fine. We were talking nicely. There was giggling and everything was as if my temper was not raised or my patience not short. This only made me feel worse. I decided I needed to go somewhere I would be surrounded by small children and their moms, dads and family. I needed to take myself away from the abuse I was mentally giving myself. Basically remove myself from my harsh thoughts of the mistake I made this morning. I went to the park. I sat on a bench alone and listened to the children play and the conversations that were taking place. I heard moms yelling at their kids. I heard moms loving their children but also heard the frustration in their voices. I heard some losing their cool and yelling. This is when my clinched tight body began to loosen. It was a reminder that not everyone is perfect and sometimes we just lose our patience. It helped bring me down to a place of comfort, appreciation and love. I was able to let the abuse rest and remember all the amazing times that I didn’t get upset. I remembered all the giggles and laughter I shared with G and I. I remembered all the sweet times and even the not so sweet times but they were our times and we made it work together. The kids woke up so excited this morning. It was fairytale day at summer camp and they were ready to celebrate with their friends. The laughter and the silly giggles between G & I had me smiling all the way to camp. It wasn’t until we got to the corner and a lady walked up the stairs at the subway station that my smile sadly turned in to a bit of anger and sadness. As my giggling holding hands twins were walking by this lady, she looked directly at them with this horrible disapproving expression while mustering the words “it’s not a good time for him to be wearing that costume.” Shaking her head disapprovingly while continuing her rant. It took all that I had in me not to lose my temper. I immediately looked at my children still walking ahead of me but now slowly to try and make out what she was saying to me but at the same time still trying to continue the happiness they had been enjoying all morning. I stared at them to make sure they turned away from us and I looked at this lady and as much as I wanted to protect my kids by saying something I would regret or could possibly turn into something that I did not want to teach my kids, I swallowed and said I am so proud of my kids and the costumes they selected to wear. I followed that by saying, it’s with a pure heart of love and kindness for my children that I will continue walking along without letting your ugliness affect my day. 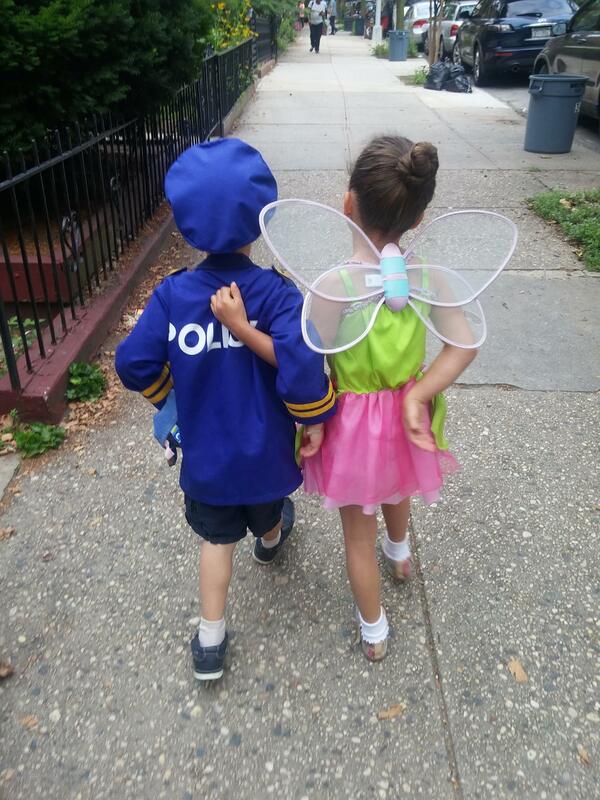 She said something about mother’s like me…at that point I could no longer hear her because all I could see in front of me was a beautiful tinker bell and a handsome sweet police officer who said he would protect all the fairies at camp and that is why he chose that costume for today’s event. We finally got to the front of the school when G stopped us and asked me why I looked sad. He then said was it because the lady was sad? I smiled realizing that he was just worried that maybe she was unhappy and couldn’t see how mean she was being. Instead he chose to believe maybe she wasn’t happy and that was why she was saying things to me. At that moment, I realized how kind and innocent their hearts truly are. How much love they are surrounded by and how we strive to teach them every day what love is and how to treat others with that same love and respect. We walked into the camp and were surrounded by different religions; different race, different colors and all they saw were friends. They greeted each counselor Black, White, Spanish, Italian with smiles and hugs. It was then that I realized this is how we should be. Why can’t we just see this? Why can’t we lift each other with happiness? With all the sadness going on in this world why do you want to take away children’s happiness? Before I left the camp I looked back one more time to see how everyone despite the color of skin were getting along, smiling and just appreciating all the costumes and the bonds they were making. My smile came back and I walked out knowing that today was going to be a good day! Hearts are breaking and tears are flowing. The loss is present and we are surrounded by sadness of family and friends who left this life too soon. These past couple of months seems to have many I love in pain. From my families loss to friends who continue to lose someone truly close. I want to extend my deepest sympathies to all those who are suffering. Who continue to try and understand why they are gone. There’s never a good answer or time but all we can do is believe that God is doing what he needs to do. We can hold on to the memories that we so beautifully shared with those lost. Each day gets better or so they say. All we can do is live each day surrounded by love of family and friends and live each day helping each other. Stay safe and remember there is always someone who loves your smile so even though it’s hard be sure to show it.